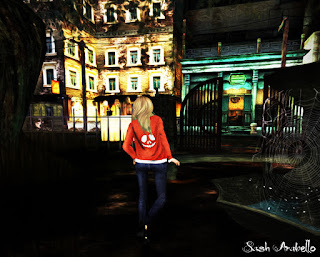 Ramblings of an SL Shopaholic: Kidnap the Sandy Claws! And so, another Halloween goodie for you guys today. I was browsing the marketplace, all bored like, and found this cheapie by Redgrave, a small Halloween Cardigan that's perfect for the holidays. It's not.. overly festive, but the little skull that looks like Jack in the back does add for a very nice touch. I went for the overly casual look today, just paired it with a tank from Tres Blah, and some mesh jeans, and one of my favorite hairstyles from Truth, Stevie, and voila!